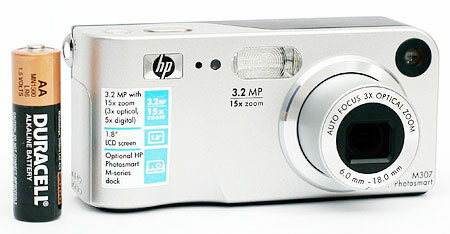 The Photosmart M307 is one of two entry-level digicams that were recently released by HP. The M307 offers a 3.2 megapixel output and 3x optical zoom. Its 4.1 megapixel brother is very similar with a slightly larger sensor. The M307 offers all the functionality that you would expect from reasonably priced point-and-shoot digicam, including an Auto shooting mode, several preset modes, and a video recording option that captures both video and audio. As HP continues to develop their cameras to compete in the digicam market, we were interested to see how their cameras compare to big-name camera companies like Nikon, Canon, Olympus, etc. In our review, we discovered that although their entry-level cameras are priced right, HP may still have some work ahead of them. The M307 proved to be rather slow in terms of startup, shutter lag, and write times. In addition, we found its images to be very noisy even at the lowest ISO setting. The camera proved to have a decent resolution performance, but moiré and stuck pixels are visible throughout its images. Read more to find out all the details. Product Sample provided by Newegg.com.